Works for all types of hair loss and scalp conditions including: male or female pattern, chemical damage, eczema, seborrhea, hormonal changes, medications, diet and stress. 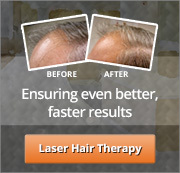 Laser is much more effective when used with Minoxidil, DHT blocker and sodium laurel sulfate free shampoo. Increase usage of laser by combining home usage of handheld lasers. Energization — Transforming laser energy into cellular energy. Laser light increases the energy available to cells so they take in nutrients faster and get rid if waste products. Not surprisingly, many scientists and physicians have been using low level laser over the past 30 years to speed wound healing and produce new tissue. Circulation — increasing blood and lymph circulation through vasodilatation. Microscopic studies have shown laser increases circulation and oxygenation of the blood to the scalp and hair bulb. Laser also removes calcification and blockages around the hair bulb; as well as increases cell replacement or regeneration activity. Laser helps hair to improve in fullness, shine, body and elasticity; therefore problems such as excessively oily or dry scalp, dandruff and itchiness can also be reduced. Vibration — Bringing cells into harmonious oscillation patterns. The soft tissue and fluids in our bodies actually vibrate! They do this within a frequency range similar to that of cold-beam, red-light laser. When its vibrations become irregular or out-of-step, it can be brought back into “synchronization” by being irradiated with low level laser working at quantum level. Q: Have the benefits been scientifically measured? A: Yes, many studies have been done and several more are currently being undertaken to prove that Laser works. Long term international and recent clinical trials suggest many benefits from laser hair treatments. One recent study showed that more than 90% of users achieve some positive benefits and results. In addition, more than 44% of users see noticeable benefits within the first 6 weeks. Another 45% see results within 6 to 12 weeks and the rest see subtle improvements after 12 weeks. Q: Does Laser work for everyone? A: Laser is recommended for hair replacement for women and men who are in the early stages of hair loss or who demonstrate sufficient hair follicles capable of being rehabilitated by the laser hair therapy program. To maintain a healthy head of hair, especially if there is a history of baldness in your family, the sooner you start the better. Q: Can I use it with transplants? A: yes. In fact, it is used post operatively to promote healing, reduce scarring, and ensure a higher rate of success for transplanted units. It has been proven helpful when used before and after transplant procedures to help establish new grafts and minimize shedding of transplanted hair. Treatment should cease two weeks prior to surgery and resume two weeks after surgery.